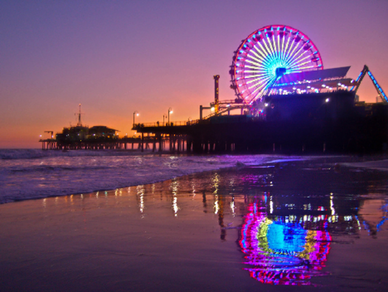 When one thinks of Santa Monica, the attraction of the Pier inevitably comes to mind. Its red and yellow Ferris wheel is a city icon. The Pier offers Pacific Park, a full service amusement park, combined with plenty of restaurants, bars, and souvenir shops, as well as an entertaining arcade with more than 200 games. Pacific Park’s solar-powered Ferris wheel makes it the only one of its kind in the region. By day, marvel at the historic Looff Hippodrome Carousel, check out the street performers, or snag a stick of puffy cotton candy. The views of Malibu and the South Bay are pretty outstanding and make for the perfect evening when watched with a beer in hand. Stick around past sunset and you might just catch live local music to the sound of the nearby waves. The Pier is a must-visit Santa Monica attraction that really sets Santa Monica apart as an ideal destination for families and visitors of any age. Open to the Public: Tuesday – Friday: 2 – 5 p.m., Weekends: 12:30 – 5 p.m.